If it ain’t fixed, don’t break it. This past weekend saw one of my favorite operating events, the Straight Key Century Club (SKCC) Weekend Sprintathon. Just a bunch of guys sending slow to medium speed CW, exchanging SKCC numbers, and generally hanging out amidst an atmosphere of general ham radio bonhomie. I much prefer it to the monthly sprints, which are also fun but only last two hours in the middle of the week. The two hour thing generates mild anxiety on my part, I feel performance pressure. No, the WES, which lasts 24 hours, is really relaxed and totally pleasant. Each month’s Sprintathon has a theme, usually topical in nature. The theme is used to structure bonus points in the competition and usually involves some addition to the contest exchange. The theme for the October Sprintathon was “OctoberFest” – I’ll explain in further detail what that has to do with this post in a bit. Over the summer, in the midst of my preocupation with the Drake 2-B, I spent a lot of time looking at boat anchors on eBay. I think what got me started was seeing an auction for an Eico 723, which looked really good. Didn’t win it though. I kinda got fixated on the idea of one of these small “novice” transmitters. They are not huge in size, mostly crystal controlled, and typically put out about 40 watts for the novice maximum input power of 75 watts. After much looking around, I found an auction for a nicely refurbished Knight T-60. This rig is typical of the breed; the one I found had already been re-capped and was described as working. It had a minor blemish on the cabinet, which is probably why I got it for as little as I did. When I tested it, it was in fine working order, and the blemish did not seem to have any impact on its transmitting abilities. It pulls about 60 watts input, and can put out more than 30 watts when tuned for “maximum smoke”. I brought the T-60 to the upstate QTH, and carefully installed it at the operating position occupied by the QRP Blowtorch. The Blowtorch is now occupying a place of honor in our living room bookshelves, ready to spring back into action in a moment’s notice. But the lure of those 30+ watts, given the limitations of being rockbound and the general lousiness of band conditions of late, was irresistable. 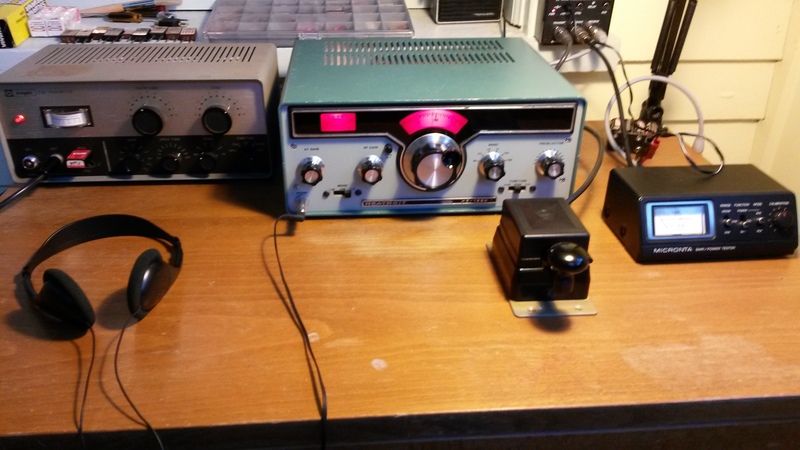 I am a QRP guy through and through, but occasionally one needs 30 watts. It’s good for the soul. The T-60 uses cathod keying. 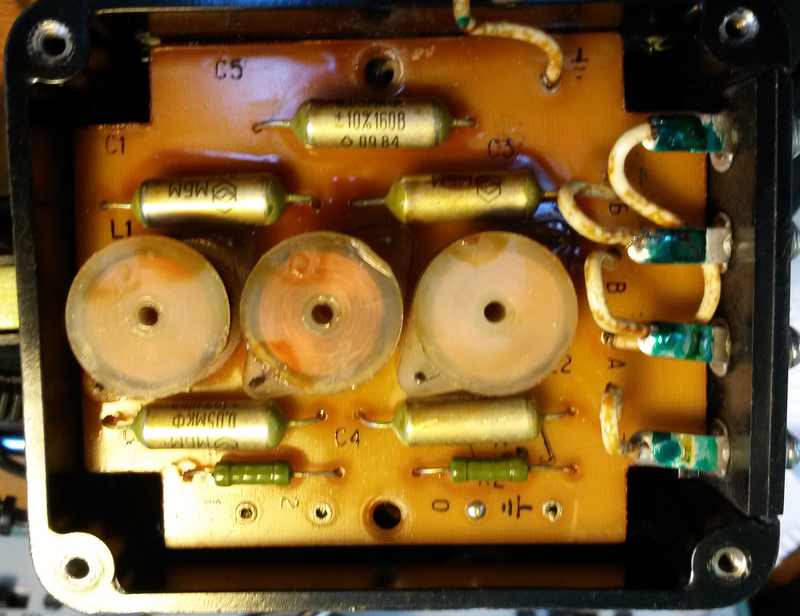 Typically cathode keying runs about 100 vdc on the key, and you need to be very careful where you put your fingers. For that reason, I have certain keys that I prefer to use with the tube rigs. One of which is my Soviet Military Key (SMK). These keys can still be easily found on eBay – they date from the 1970’s and were surplussed out in large numbers. From what I have seen on eBay these days, they are a bit more expensive than when I bought mine about ten years ago. They are still a great value though: easily adjustable, pretty good feel, and best of all totally isolated from the keying circuit. The key arm and contacts are protected by a plastic shroud, and the exposed portion of the key arm is completely made of (or covered in, I’m not sure) heavy plastic. Unless you deliberately place your fingers across the screw terminals at the back of the key, there is no way to get into any trouble. Safety first, I say. Lifting the filter board revealed four wires, from the four contacts topside to filter board. It was a fairly simple matter to unsolder the board from the terminals, the wires from the board, and solder the contacts directly to the terminals. 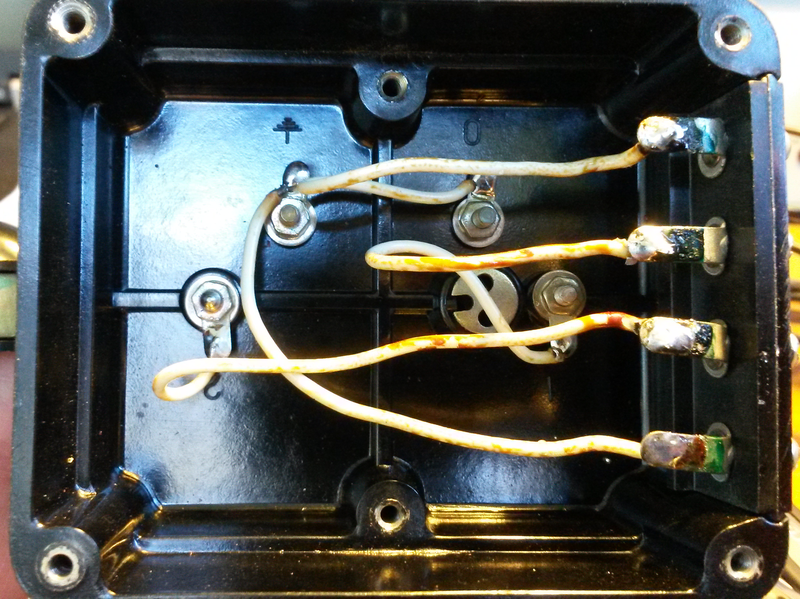 Filter board removed, contacts wired directly to terminals. In looking at the connections, I discovered an interesting fact: The metallic arm of the key is completely electrically isolated from the keying circuits. It is connected to the ground terminal, but the keying circuits float isolated from this terminal. This is a really safe key. The three terminals on the rear of the key, marked “a”, “b”, and “c” make up the keying connections. The way I wired mine, “a” — “c” are the keying terminals. “a” — “b” are normally closed, and open when the key is pressed. This could be used for muting your receiver, kind of manual QSK. After everything was buttoned up, the key works beautifully with the T-60. The station looks very nice all put together. The OctoberFest theme? Every exchange had to contain the manufacturer of the key you were using, and you get bonus points for each unique key manufactured you worked in the contest. I used my Palm Radio PPK key for WES. I heard (but did not work) at least one “SOVIETMILITARYKEY” in an exchange, so there is at least one other out there. 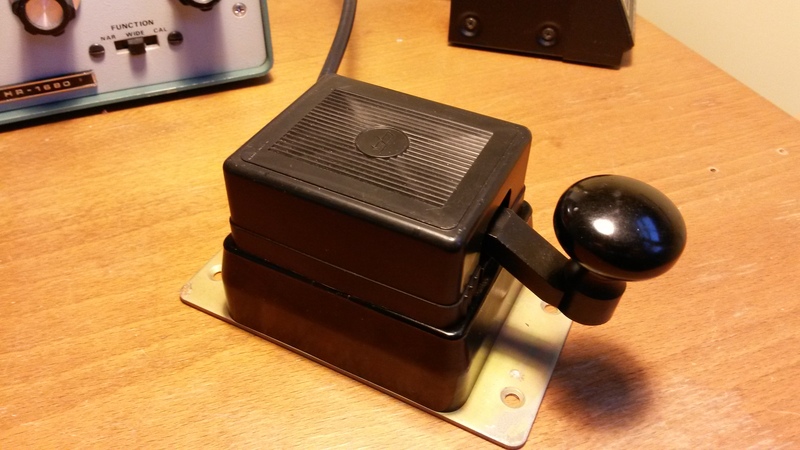 WES is over for this month, but I’m looking forward to making some more contacts with my rock crushing 30 watts, and a very safe key. 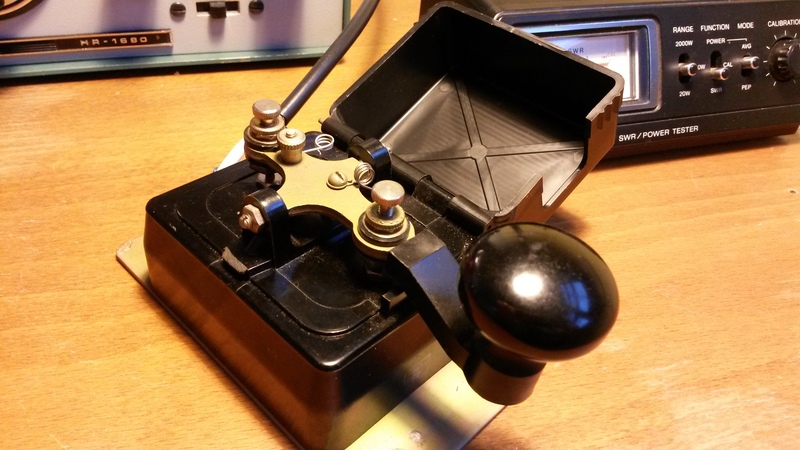 This entry was posted in Ham Radio and tagged Amateur radio, cathode keying, CW, ham radio, Knight T-60, QRP operation, SKCC, Soviet Military Key, Straight Key Century Club, transmitter, Weekend Sprintathon. Bookmark the permalink.